I just heard about the initiative from a friend. I can see myself the condition of some villages in India deteriorate over time. What was once a very fertile land with lot of greenery have now become barren. I really appreciate the efforts by this organization. Would like to be a part of this organization some time. Though I had all these thoughts messing in my mind, I'm not powerful to stop cutting down those worthiest beings. And, it's Isha's PGH which gave a break to think of planting them to millions rather than thinking to stop cutting them down. My heartiest congrats to PGH. I realize and forsee Green TamilNadu with PGH. Great Work and I would like to join my hands too!!! In our day by day life, we need oxygen to be alive. At least to get it, we should join with Greenathon. Surely it will make great change forever future to all. Great Inspirational site.. It helps us to create awareness about pollution.. Somewhat to avoid pollution.. I believe, it's a very good opportunity for every one to create a green earth with plenty of trees. Amarnath: Thanks for Green Hands...! I have to thank for all the green hands. I like verymuch the ISHA's green hand, because they are going to sow the importance of green for the world to the young generation. I too interesting to work for green hand. Here is one video I want to share with you. I want to share a 15min video about reforestation. Please view it completely and it provides a lots of insight. I used to travel a lot. In the recent past, the roads are smoother and wider but at what cost...? Several thousands of Trees over several decades old on Both sides of the roads had been cut. Its really paining..., in future we may not have a road with atleast one tree. Though we cant compensate it in whole... Let us do it atleast a bit. My whole hearted support for this effort. The Project Green Hands is great inpiration to the younger generation. It is great service to the humanity. The overwhelming dedication of the volunteers is to be greatly appreciated. We can surely create a greeny earth. PGH is a massive collective effort by sadhguru. Immense pleasure to be the part of project green hands. To add 10% to TN's existing green cover is a bold, but beautiful goal. I hope your initiative gathers more momentum. Have read and heard the discourses of Sadhguru... these are truly inspiring. I hope Tamil Nadu undertakes more projects to conserve drinking water... even if the government spends more money for this, the returns would be truly sustaining. Trees seem to welcome rainfall more than people's penances. heartening to see this effort by Isha Foundation. In the poem "Jnanapana" the great Krishna Devotee, Poonthanam, says that the "Suras" or the Devas are born as trees... which only increases our respect for these trees very much. God Bless! Project Green Hands has been an inspirational work. 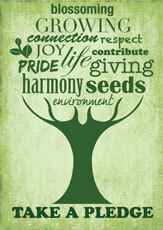 Let Project Green Hands spread prosperity all over. Allow me to use this message board opportunity to mention about some Green Seva/ Service that we can do online, without any monetary expense from our side. Thankyou for giving me the opportunity to mention about these links here. Wishing the Best to Project Green Hands. I'm very glad to join in this project. Along with my friends we are planning to plant trees in some parts of chennai. Great work! Heard a lot about your organisation and project. I am an environmental economist on the faculty at the Delhi School of Economics, currently visiting NUS Singapore. Let me know if I can be of any help, esp. with regard to CDM credits for afforestation. I heard about the project green hands on a CD and the involvement of Isha foundation in it. I am very interested in it. I am an engineer practiced electrical engineering for a few years- mainly revolving around the components which support Solar and Wind power conversions - Green Energy. Currently I architect Database Systems in US. I believe that global warming would cause mass scale suffering and destruction. We all should do something for our generation and future generations. "Save Plant Earth" - Saving trees is one way.